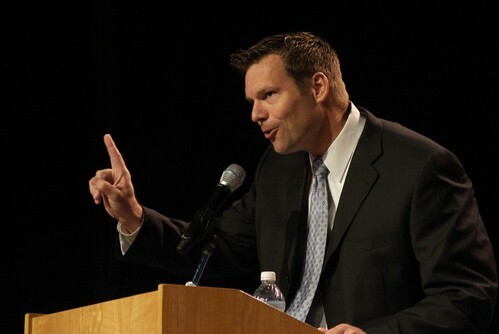 Kris Kobach’s official job title is Kansas Secretary of State. But he is better known for drafting—and being hired to defend in court—state and local immigration laws designed to make undocumented residents “self-deport.” His two most notorious undertakings are Arizona SB 1070 and Alabama HB 56, which have largely been eviscerated by federal courts. Yesterday, Kobach embarked on a new legal escapade, filing a lawsuit to block the Obama administration from granting deferred action to so-called “DREAMERers,” undocumented immigrants who arrived in the country as children. Fortunately, although sure to generate headlines, the lawsuit has little chance of standing up in court. The basis for the lawsuit, which is being funded by the restrictionist organization NumbersUSA, may sound simple enough. The plaintiffs are 10 members of Immigration and Customs Enforcement (ICE) who believe the “Deferred Action for Childhood Arrivals” (DACA) initiative, which would grant DREAMers two-year reprieves from deportation, is prohibited by federal law. So long as the initiative is in effect, the agents allege they will have to violate their oaths to uphold the Constitution or face disciplinary action for disregarding their superiors’ instructions. Regardless of whether the agents deserve our sympathy, the lawsuit is highly unlikely to succeed. To begin with, even if Kobach’s arguments were correct (which they’re not), it’s unlikely that any court would reach them in the first place. Why? Under the Constitution, federal courts lack “jurisdiction” (i.e. authority) to resolve internal disputes within the other branches of government. The reason is obvious: if government employees could sue their superiors over legal disagreements, they could—quite literally—make a federal case over any difference of opinion. ICE agents hauling the head of the Department of Homeland Security (DHS) into court is like a law clerk suing a judge for writing a decision with which she disagrees—or Kobach’s own subordinates in Kansas seeking an injunction requiring him to perform his actual job as Kansas Secretary of State. It’s just not how the legal system works. Jurisdictional questions aside, Kobach’s argument relies on a reading of federal law that no administration, Democratic or Republican, has ever followed. His primary assertion is that an obscure provision enacted in 1996 requires the government to initiate removal proceedings against any immigrant who entered the country illegally—without exception. In truth, as the Supreme Court said in the Arizona case, the President has “broad discretion” to enforce the immigration laws as he sees fit, including determinations of “whether it makes sense to pursue removal at all.” And even if Kobach’s reading of the statute was correct (which it’s not), his argument would not apply to immigrants who entered legally and overstayed their visas—as many DREAMers did. In light of these shortcomings, courts will hopefully recognize the lawsuit for what it is: sour grapes.Poll after poll has shown a majority of the public expressing support for the administration’s deferred action policy. Meanwhile, the HALT Act, a bill introduced in 2011 that would prevent the Obama administration from granting deferred action, hasn’t even merited a vote in the House Judiciary Committee. Kobach certainly realizes the American people don’t share his displeasure with the Obama administration’s policies on prosecutorial discretion. So unable to make use of the democratic process, he has sought to tie up the initiative in court. Just as the challenge to Arizona’s SB 1070 was framed as a test of “states’ rights,” Kobach is certain to portray this current lawsuit as raising profound questions of presidential power. It does not. The lawsuit is a policy disagreement—and a publicity stunt—masquerading as a constitutional claim.